2 cups of all purpose flour or maida. 500 grams of minced (almost paste) chicken. 1/4th cup of finely chopped onion. 1 Tablespoon of finely chopped ginger. 2 green chilies, finely chopped. A handful of chopped green onion. 2 Tablespoons of lemon juice or vinegar. 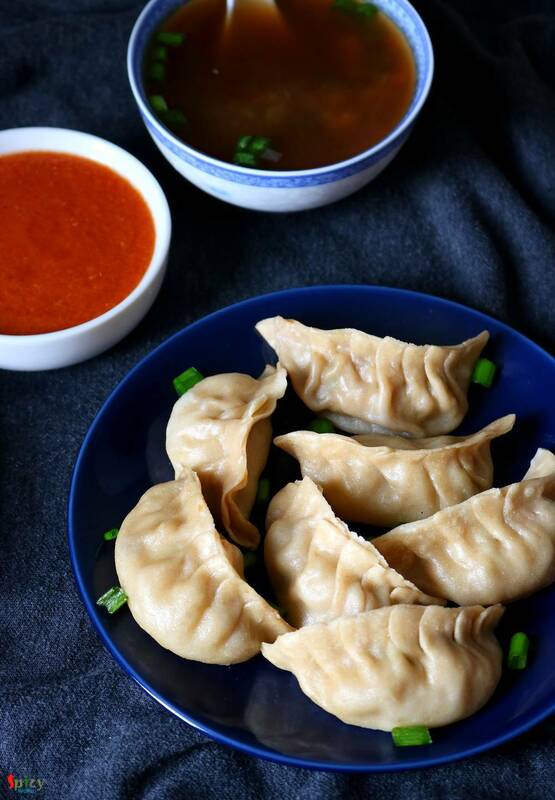 You will need very smooth minced chicken almost like a paste for momo. If you get that chicken then it will be okay otherwise put the minced chicken in a blender and blend it for 2-3 times, it will become smooth. Add salt, pepper powder and melted butter or oil in the chicken paste. Next add chopped onion, ginger, garlic, green chilies, green onion, soy sauce and lemon juice. You can add some MSG, if you want. Now mix everything well with your hand or spoon, then keep it aside for 3 hours or for the best result keep it in the fridge for overnight. For the dough, mix flour and some salt. Then gradually add warm water and make a firm dough - neither very soft nor too hard. Knead the dough well for 2 minutes then apply 1 Teaspoon of oil all over it. Cover it with a damp cloth for 30 minutes. After that take a small portion from the dough. With the help of some dry flour roll it to a thin round disc. Place a round shaped bowl on it and cut 2 or 3 rounds. You will get perfect round and thin wrapper. Do the same with rest of the dough. Obviously you can individually roll very small balls one by one. Place one wrapper on your palm. Then put a tbsp of chicken filling in the center of the wrapper. If you are a beginner then go with small amount of filling. Now is the tricky part. No, don't feel scared, making the plits is easy. After making 2-3 momos it will appear easier. First make one pleat and then immediately pinch it with the other side. For better idea I will suggest you to watch the video. After making all the pleats, pinch the edges one more time to make it safe and secure. Make rest of them. Heat 2-3 cups of water in a big vessel. Then place a steamer over it. I didn't have any steamer so I bought an aluminium foil tray from store and make small holes with a chopstick. Brush some oil all over the steamer. 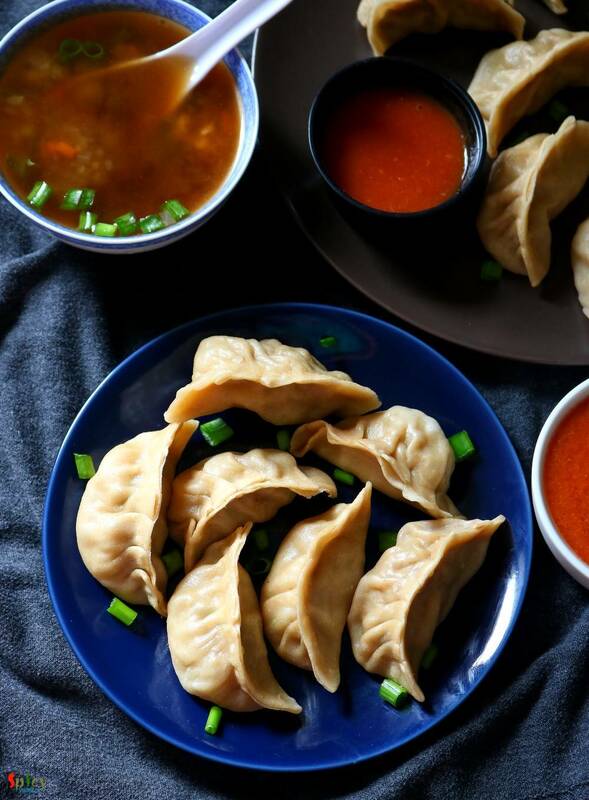 When the steam starts coming out, then arrange the momos. Do not overcrowd the steamer otherwise they will stick to each other. Cover the steamer with a lid and steam them for 15-20 minutes. 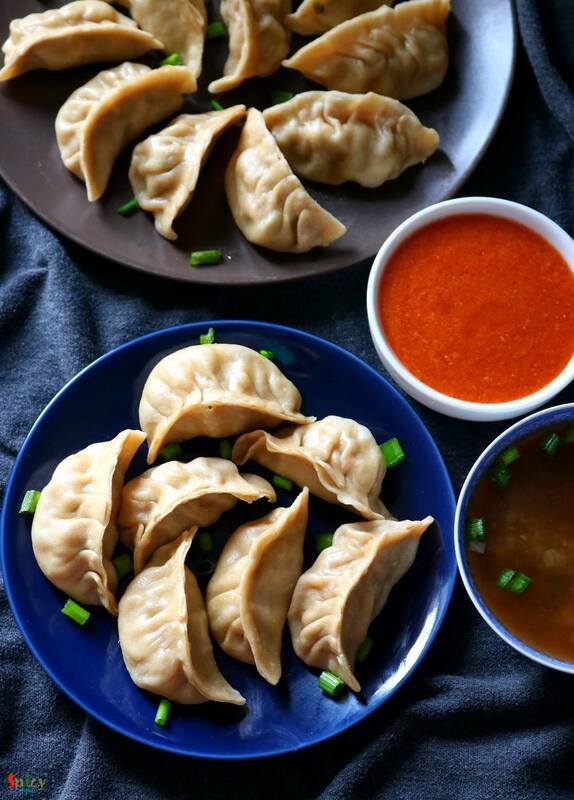 Then open the lid and take the steamed momos out. Arrange another batch and again steam them. I have already posted the smokey, hot and spicy chutney recipe to go with the momos. Please check that out. 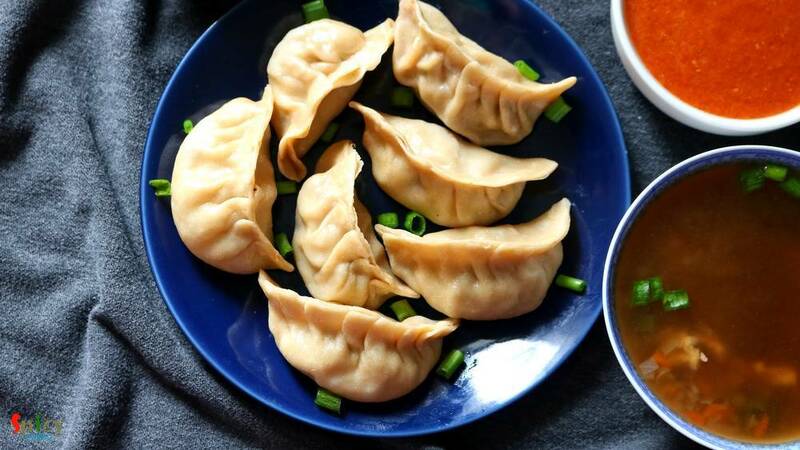 Your steamed chicken momo is ready to serve. Serve this hot with spicy chutney and soup.